Kevin receives a phone call from a friend asking him if he could join them for lunch in 15 minutes. Kevin replies “Sure, I will be there.” He is still drafting an email and needs to drive a bit before he can get there. There is no way he could make it in 15 minutes. How often do you come across people who show up late for an interview or a casual friend meet up? It is more or less a daily occurrence.There is always a justification that follows such as jam-packed traffic, having to drop a friend or the alarm not sounding. It is said, “Punctuality is the politeness of Kings.” The secret to effective time management starts with punctuality. This applies both to work and outside work. Are you that person who shows up late when meeting friends? Do you answer a phone call saying “I will be there in 15 minutes” when you are well aware that you need more than 30 minutes to make it? Being late is both a habit and a disease, a contagious one. With time people start showing up late for your meetings because they know you will be late anyway. If you cannot honor a time commitment, it is simply impossible for you to be effective at managing time. Being late regularly implies two things. One, lacking the discipline to show up on time. Two, lack of respect for the time of the other individual/s. In addition to this, every time you do not honor your word, you lose respect for yourself. The more you do it, the more your mind is convinced that it is acceptable to be late. When you repeat this enough number of times, you will end up being a person who is not taken seriously. If people jokingly mention that you are always late, know that it is nothing to be proud of. If you have trouble managing your time well, start being punctual with everything. Effective time management is more of a habit, a mindset, and a lifestyle. It is not a process to follow. You do not need to read a book or hear some expert advice to be punctual. It is plain common sense. If you are anticipating traffic, leave a little early. You already know what it takes to be punctual, you just need the discipline of applying it in practice. This brings us to another set of people who are punctual but face difficulty in managing their time well. This is where Covey’s Model helps, explained by Stephen Covey in the book “The 7 Habits of Highly Effective People”. The model uses four quadrants to break down all of your daily activities. Let us start bottom up. These activities must be kept to a minimum. However, eliminating this completely can lead to burn out. Your mind needs to take a break and refresh. At the same time, keep these under check. Do watch TV or spend time on Facebook or what you consider leisure, but also keep in mind that this should not be your priority. You will face distractions every day and it is out of your control to eliminate it. Someone will knock at your door, you will receive a call which serves no purpose and emails will land in your inbox. The key is to remember that you have important things to do and not be carried away spending time on these. When someone asks you to do something which does not help you achieve your goal, do not mistake it as important. This is the most common form of distraction and you should be comfortable to say “no”. You do not need to check all your emails instantly or reply to every single message immediately. A good example is emails that need an action immediately or they lose value. For example “Chocolates at my desk, please hurry.” These chocolates not only distracted you but also added some unnecessary calories. This is where everyone wants to be but hardly is. You have a dream career or a business venture in mind. It will not turn into reality magically unless you spend time in this quadrant. Know what falls in this quadrant for you and spend time on it. Everyone has different things to do in this quadrant. What is a dream for me could very well fall into some other quadrant for you? A common mistake is to confuse crisis with this quadrant. Though a task might be important, it could be taking time off your schedule which could have been spent on this quadrant. It is easy to fall victim of a mindset where we believe we have a lot of time ahead to achieve our long-term goal. Hours turn into days, days into months and months into a year. Time just flies by and you are a year older in no time without having made any progress towards your goal. The tasks in this quadrant are those that are postponed most often. Resist the urge to do that. If not, you will end up being exactly at the point where you are today. These are urgent and unavoidable. They cannot be ignored, nor should they be. A crisis of different magnitude, from a realization of missing meeting preparation to a disaster, will show up often. You have no choice but to handle this before anything else. It is absolutely acceptable to spend time on these, but watch out if this consumes most of your time on a daily basis. A common example is firefighting daily issues all the time. It might teach you a few good things, however it is consuming valuable time of yours. It is an impediment from making step wise progress towards your long term goals. You will be trapped in this vicious circle of crisis management. Get out of it. Firefighting will fetch you short-term benefits but it is the long-term that we are aiming for. Spending most of your time on this quadrant seems illogical and impossible at first, but the benefits that you reap a few years down the line are paramount. I understand the problem, what now? 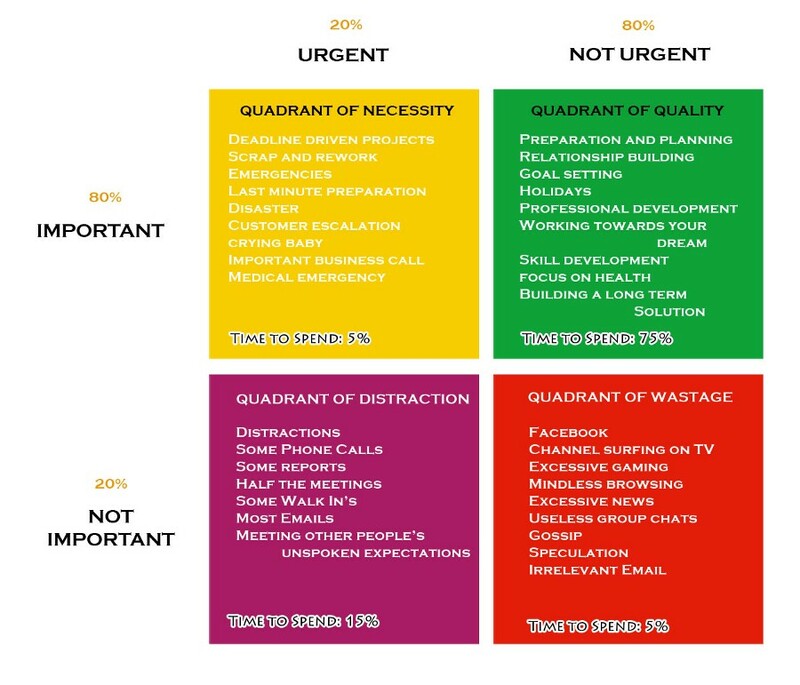 By being able to categorize all of your schedules into 4 of these quadrants, we now apply the Pareto’s Principle(80/20 rule) to divide your time. This is just an approximation towards the percentage of time that must be spent on each quadrant on an average. If your numbers are close enough, you are in the right direction. Refer to the picture above and aim to spend your time as follows. If the above seems way too much of complicated math to apply, you can try the approach below which has no numbers involved. List Down Urgent activities and plan to stop them. If it is a recurring activity, plan how could you stop them from repeating. Example: If an intermittent unknown scenario in code hampers business time and again, come up a plan to fix the bug rather than working on the problem every time. If it is an emergency, plan how could stop it from being a crisis next time. Example: If you find yourself regularly scampering around last-minute meeting preparations, set up a reminder or a to-do item beforehand. Next, look at your Quadrant of Distraction and avoid them too. The easiest way to do it is by cultivating a habit of saying no, which is also the hardest part. Break each item in this quadrant into smaller, measurable and tangible goals. For example a goal of ‘start my business venture of a restaurant’ is meaningless. You have to break it down further: find a location, contact an accountant, decide the menu, find a cook and so on. The more detailed the breakdown, the faster you will get there. Ensure you follow and clean up your to-do list religiously. A to-do list that just piles up does no good. Identify which activities of yours fall into which quadrant. If random browsing brings you peace of mind after a tiring day at work, it can very well be your Quadrant 2 activity as long as you know how to strike a balance. Now identify where do you end up spending most of your time? 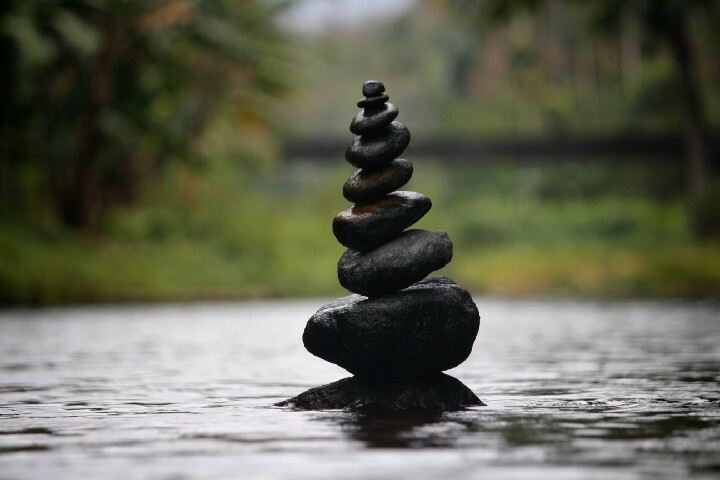 Was this aligned with your long-term goals? Pledge to change this routine. Previous articleArtificial Intelligence and you. Next articleWhich type of leader are you? A thermometer or a thermostat.